General Polymers Now Distributes Mitsubishi Chemical Performance Polymers’ TPV Elastomers in US, Canada, & Mexico. 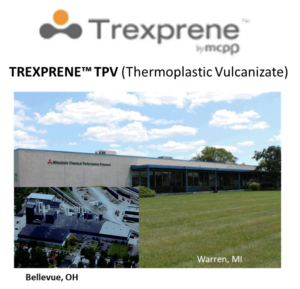 General Polymers Thermoplastic Materials, LLC is pleased to announce a new distribution agreement with Mitsubishi Chemical Performance Polymers for Trexprene TPV elastomer compounds for the US, Canada, & Mexico. TREXPRENE™ TPV (Thermoplastic Vulcanizate) is a heat stabilized, vulcanized PP / EPDM product. Globally available for a wide range of applications and approved to a variety of Automotive Specifications. Thermoplastic vulcanizates (TPV) are part of the thermoplastic elastomer (TPE) family of polymers, but are closest in elastomeric properties to EPDM thermoset rubber, combining the characteristics of vulcanized rubber with the processing properties of thermoplastics. TPV is a dynamically vulcanized alloy consisting mostly of fully cured EPDM rubber particles encapsulated in a polypropylene (PP) matrix. There are a variety of grades which are used globally in the automotive, household appliance, electrical, construction and healthcare markets.